Determined to increase its influence on the French and international cultural scenes, Filitosa equipped itself with a new archaeological museum destined to receive unearthed objects on the site and present them in an educational experience. The installation of the building, as well as its architecture in natural stones, is perfectly and harmonious integrated in the environment. A new official website was also created, filitosa.fr, characterised by its ease of use and the richness of a content adapted to a perfect understanding of the visit. 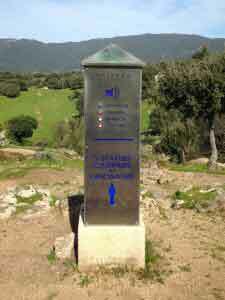 Filitosa was added to the list of the hundred historical sites of common concern for Mediterranean countries. Already famous for the grandeur of its natural environment and the mild weather, Corsica now embodies the cultural richness symbolised by the rare and mysterious beauty of its statuary art, like its distant cousins in Stonehenge, Great Britain and Easter Island, Chile. With the increasing number of tourists, and in order to protect the site, constructions are done every year. A granite pavement in the central alley, markers and terminals in various languages mark out the path. Years of communication. More and more German, Italian, British journals took interest in the myth of Filitosa. The site was often subject to television shows and national and international radio shows. Event. The thirtieth anniversary of the resort was celebrated. For the event, an international promotion campaign was launched, thanks to the distribution of a stamp. According to the General Director of the Parisian Postal services, this was one of the best operations of the year. Over a million letters bearing the image of Filitosa were stamped across the world. 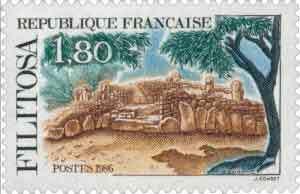 The stamp was more sought after than the one for the 200th anniversary of Napoleon’s birth. 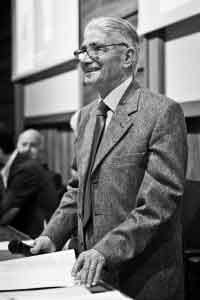 Charles-Antoine Cesari died at the age of 73 after a lengthy illness. 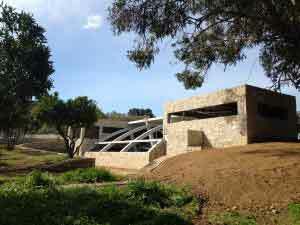 When passing, his children chose one of them to make the image of the site shine. That task was entrusted to Jean-Dominique Cesari. A different generation, however, the same will and energy as his father, entirely focused on the success of what is far more than a family business, a heritage with which the Cesari family is intrinsically linked. Classified as a historical monument. In the immediate surroundings of the site, housing developments were built (“Le Torréen” village). A bar and a crafts centre opened. Everything was built to respect the soul and the spirit of the place. Recognition. 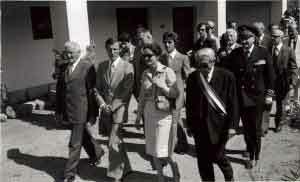 During the visit of Mrs Anne-Aymone Giscard d’Estaing in Corsica, the French First Lady wished to visit Filitosa in the presence of personalities of the time such as the late Jean-Paul de Rocca-Serra, President of the Corsican Assembly. Roger Grosjean died in Bastia at the age of 55, at the apogee of his career, after dozens of publications spread over twenty years of fruitful research. In his book, Corses des Origines (Corsicans of Origin), Joseph Cesari, Regional Registrar of Corsican archaeology, paid tribute to the man who put the island into the limelight by gaining recognition from archaeologists worldwide and general public. 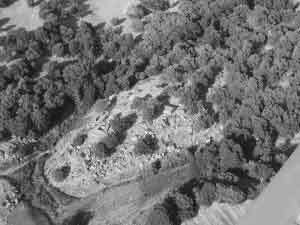 The site has not yet shared all its secrets, but since then it has had the special attention of scientists and ancient history enthusiasts. Beginning of recognition. Until then, Corsica had not yet really taken part in the mass tourism circuit. The insular economy was not centred on cultural tourism. Yet, immediately, Charles-Antoine Cesari worked at the construction of a documentation centre. He believed in the imminent upswing of the prehistorical resort. Filitosa made a dramatic entry in the Corsican cultural landscape as well as in the collective memory. The “granite warriors” became an inspiration. Filitosa started to appear in Corsican literature: “Ci so nati l’antichi, dippoi la Filitosa” the group Cantà u populu corsu sang, after a poem by Ghjacumu Fusina. The resort became an increasingly visited site for Corsican students discovering archaeology. At the cost of enormous sacrifices, the popularity of the place increased. In collaboration with Roger Grosjean, Enrico Atzeni, an Italian archaeologist and professor at the University of Cagliari, started new excavations that revealed, in particular, the richness of Filitosa’s objects. Today, these remains are exposed in Filitosa’s archaeological museum testifying of the different stages of the building of the site. Stubbornness. The creation of the resort was difficult at the beginning. 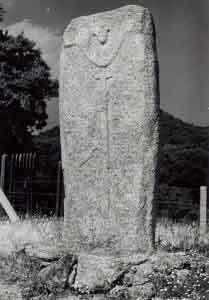 Later, the success of the site created an emulation in the region, but at first no one believed in these stones. 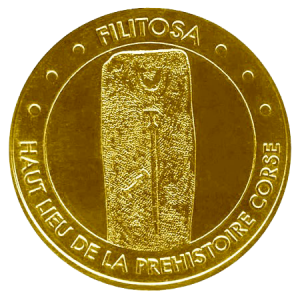 It took nearly twenty years for people to believe in Filitosa. Even on the administrative side, at the time, the landlord, could not hope for much. 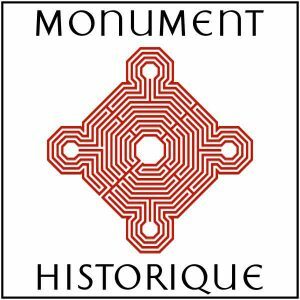 Charles-Antoine Cesari and Roger Grosjean made numerous grant applications in order to continue the excavations. But at the State level, as well as locally, there were very few answers. Seeing the inertia the procedures were meeting, Charles-Antoine Cesari decided to invest the family’s last assets and made a point, a few years later, of refusing a pathetic grant of a million old French Francs, offered by André Malraux, Minister of Culture at the time. First explorations. It was the beginning of the great adventure, going from discovery to discovery. The excavations started in a general enthusiasm, slowly remains of several civilisations were unearthed. Charles-Antoine Cesari and Roger Grosjean needed to ensure the protection of the site from malicious people and vandals. For example, they feared that the statues would be deteriorated (some neighbouring shepherds wanted to open them, thinking that they were full of gold). 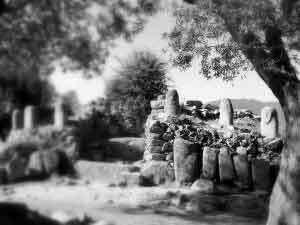 The statue-menhirs were then gathered (alignment of the five statues below the mound, facing the millenary olive tree). Critical time. 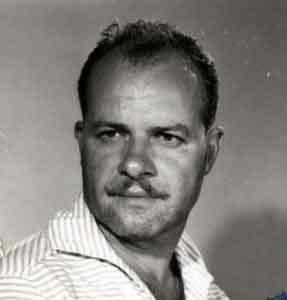 Roger Grosjean, archaeologist and researcher at the CNRS (National Centre for Scientific Research), was dispatched to the island. 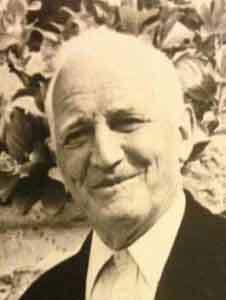 He undertook a scientific career with “Corsican Prehistory” as a research theme, under the dual sponsorship of the abbot Breuil and Raymond Vaufrey. 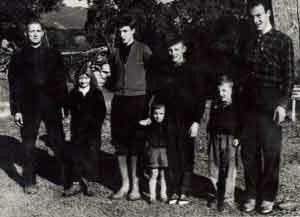 The real excavation work started with Roger Grosjean on the domain of the Cesari family. He found a strange, yet promising, clear space, which is for any scientist an object of desire. 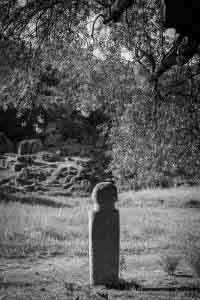 Without knowing it, he probed the mysteries of this field and made the old stones speak until his death in 1975. 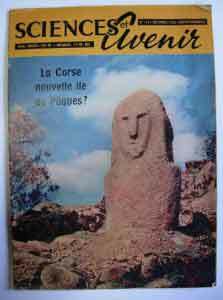 At that time, in Corsica, very few people were interested in archaeology. Charles-Antoine Cesari informed Pierre Lamotte, who was then the director of the Corsican local Archives. He made the trip to Filitosa. He was the first official to understand the importance of the discovery. Genesis. On a silent piece of land, disturbed only by the murmur of streams and quivering olive trees, in the middle of a stunning “Filetta” (fern land), on the new property of the Cesari family, the miracle of Filitosa was born. Here, in the locality of Petra Zuccata, Charles-Antoine Cesari discovered, draped in a thick scrubland, five granite “Paladini” lying face down. On a neighbouring mound, called “Turrichju”, he also noticed strange remains. Without knowing it, Charles-Antoine Cesari came upon what was still a thousand-year-old secret. But the sixth sense of the landed he was (he was a horse farmer), rapidly advised him of the singularity of his discovery. Persistent and determined, this place became his reason for living.